Australia’s busiest regional airport is located in the Sunraysia district in far North Western Victoria, 550 kilometres from Melbourne and 400 kilometres from Adelaide and needed to develop to cater for increasing demand for air services, but faced an energy supply problem. Mildura Airport is Australia’s busiest regional airport with 217,000 passengers in 2016 and has twice been named Australia’s Rural Airport of the Year. It needed to develop and faced an energy problem. The mains power supply is expensive and comes from the brown coal–fired power stations of the Latrobe Valley which are 700 kilometres away and incur an average transmission loss of 11%, which is power that the locals pay for, but is lost in transit. Mildura Airport is also at the end of an old power transmission line and as a result suffered from periodic blackouts and a generally unreliable supply, which meant that in emergencies they had to rely on back-up diesel generators to operate vital aviation navigation and safety equipment. 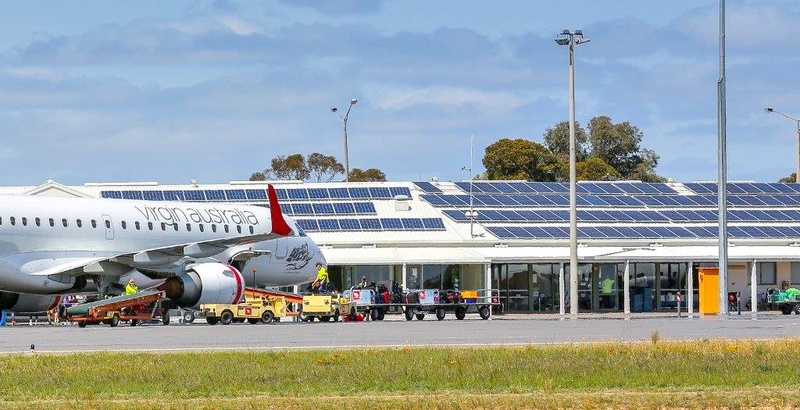 Mildura Airport employed an environmental consultant to help them plan their development and as the area receives among the highest sunlight hours in Australia he recommended that solar was an obvious solution for their future energy security. He also saw that panel efficiency was extremely important as the roof-top solar panels must have an anti-glare coating to satisfy the requirements of the aviation safety authorities. Trina Solar panels were chosen as a result of their efficiency assessment, particularly and they were the choice of several of the potential suppliers, when the contract was put out to tender. Mildura Solar undertook the solar installation which comprises of a 100kW grid connected system with 360 Trina Solar 250watt Honey TSM-PD05 panels on the roof of the terminal building and a further 40 panels on the administration building. the solar system to passengers and visitors. The annual projected energy output is estimated at 174MWh per year and the CO2 emissions savings are put at 150 tonnes per annum.